Well before Angel Lozada-Corona ever places the metal spatulas on the anti-griddle, he often fields questions from quizzical consumers. He best answer them before he makes their ice cream, however, because he doesn’t have all that much time. He pours the liquid ice cream base onto the cold plate, which is kept to negative 16 degrees Celsius, or 3.2 degrees Fahrenheit. With those spatulas, he chops two Oreo cookies he has dropped into the yummy puddle, working quickly to smash everything together. He spreads the rapidly cooling mix into a square. He runs the spatula horizontally and vertically, multiple times, to get the ice cream blanket to the proper depth and consistency. It all takes place in about two minutes. Keeping the spreader tight to the griddle, he rolls the ice cream into tight spirals. Six of them are pushed to the rim, which he then plucks up with small tongs to place in a paper cup. With flavors like S'mores Galore and Matcha Made in Heaven, 10Below is rolling up the coolest treats in New York City. Voila, he has just made his latest “Cookies Monster,” the bestseller at this ice cream shop, which opened in spring 2017. Topped with a freshly toasted marshmallow, chocolate sauce and blue cereal loops, it is an Instagram-worthy shot. Of the 23 pounds of ice cream the average American consumes each year, these days, chances are some of that will be rolled. It has taken about 10 years and more than 8,000 miles for rolled ice cream, which began as a popular street food in Thailand, to make it to Connecticut. Sometimes called stir-fried ice cream or sushi, it is ice-cream-making on hyperdrive. Each order is custom made, starting with an ice cream base. At Ice and Fire, customers can choose from vanilla, chocolate, coffee, green or Thai tea and taro (a root vegetable that is the ingredient in Hawaiian poi). Such made-to-order deliciousness runs about $7. The ingredients are fresh — chopped strawberries, mango, bananas, pineapples and blueberries — along with goodies such as graham crackers, cookies, candy, hazelnut spread and small popping juice balls. Training is imperative to keep the base from being too wet or too brittle as the ingredients emulsify. Thai-style rolled ice cream is being offered at an increasing number of spots across the United States. 10Below Ice Cream, which opened in 2015, lays claim to the first rolled ice cream shop in New York City. Since then, the concept has curled its way to the East and West coasts, moved north to Canada and pushed its way to Texas, Florida, Alabama and other southern states. In Connecticut, there are more than a half-dozen, including New Haven’s 0 Degree (with other locations, too), Wallingford’s Crazy Ice and Fairfield’s Freezing Moo. An outpost of the Sweet Charlie’s chain is just over the New York border in Mamaroneck. SoMa's Steep Creamery specializes in rolled ice cream like Matchapolitan, flavored with strawberry and matcha. 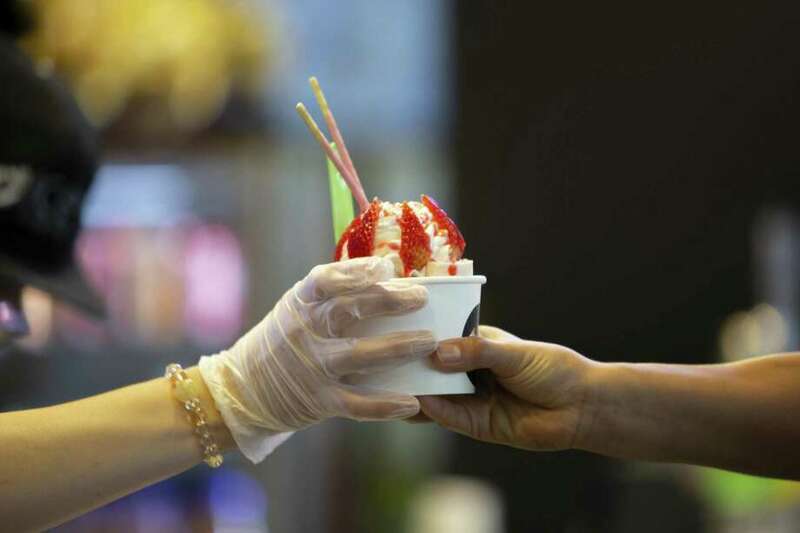 A bit of sci-fi mystery, customization and culinary showmanship makes rolled ice cream a hit. Social media and the image-driven culture it feeds has considerable influence, showing just how customizable each frozen treat can be. Of course, the idea of “mix-ins” has been around for more than 30 years, but in this instance, not only are the mix-ins what you select, but the ice cream is made on the spot, right there, for you. Lozada-Corona does not see the treat he literally pushes going away any time soon. People think it tastes good and is a bit creamier. It tends to be denser, as there is no churning and little air sneaks in while it is made.